“The affordable close” – Be optimistic about your prospects ability to pay for the item you are selling. You have to close the gap in the prospect’s mind between the cost of your product and perceived value. You can gain mental assent from a prospect that your product is good, will save them money, they need it, they would like to have it and can afford it, and still, have a customer that still refuses to buy. This means that you have convinced them of its merit but not persuaded them to buy. If you believe the sales process you do “to” people than you are a manipulator. You have to believe that the sales process is something that you do for people. “Now or never” close – The fear of loss is greater than the desire for gain. Five reasons people will not buy from you. They feel they do not need what you are selling. They do not have any money. They are in no rush to buy. They do not want what you are selling. They do not trust you. The Law of Averages – This a myth that states if you see enough people you will make sales because there is an automatic minimum sales percentage for every person. If your character is defective it is game over. There is no such thing as a good salesman who is a poor closer if you cannot close you cannot sell. If you fall short in any part of the sales process including the close, you can not sell. Period. Do not try to close before you have established in the prospect’s mind significant value for what you are selling. Try for the close as soon as you have established the value or aroused desire for ownership, even if you are not finished with your presentation. After a prospect has said no, it is your job to alter the value of your product in their mind. Each close you use should be an educational process by which you are able to raise the value of the product or service in the prospect’s mind. Do not lie by omission. 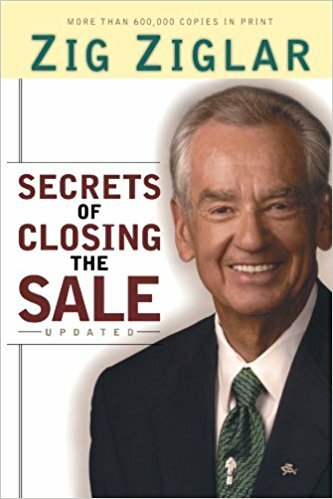 Train yourself to view not asking for the sale as an unconcerned, selfish action because you are effectively preventing the prospect from having an item that they need and will greatly benefit them. Concentrate on making the immediate sale, but concentrate on making it in such a way that you’ll be in a position to make the next one. That’s career-building selling. If you do not have the ability to transfer your feelings or belief and conviction to the prospect, you are not going to close on those close ones. The prospect is persuaded more by the depth of your conviction that he by the height of your logic. The prospect does not buy cold hard facts, they buy warm people benefits. Learn to use a voice recorder to hear your own voice and critique you on your sales presentation. This is very critical. When you talk and listen to the sound of your worn voice, the primary source of sound is coming through vibrations of the bone. When you make a recording and listen to it, the sound comes into your eardrums through the air. When someone tells you that your price is ridiculous, you repeat what they said as a question. This forces them to defend their statement as opposed to forcing you to justify the price. Response to an objection on price “Mr. Prospect, you’re going to be concerned about price one time. That’s the day you buy. You’re going to be concerned with the quality of the life of the product itself. With this in mind, let me urge you to think along these lines: Wouldn’t you agree that it’s better to pay a little more than expected, that a little less than you should? (Wait for an answer) If you pay more than expected, we are talking about pennies. If you pay less than you should and the product won’t do the job which you expected it to do, then you will lose everything. Many people are trained to say the price is too high automatically. Use the price objection as a selling point be using it as a segway to discuss the benefits which more than justify the price, or explain why the product is vastly superior to its competitors. If you are told that you just have the answer to everything and every objection, rely on that this is not the case, which is why you are so excited that in their specific situation you do have the answer. Selling is essentially a transference of feeling. Sympathy means you feel like another person feels. Empathy means you understand how the other person feels, though you do not feel the same way. “Get them smiling” close – If you can warm them up your odds of making the sale go up big time. A sell is made in every presentation. The prospect either sells you the can’t or won’t buy or you sell him that he can and should buy. “Can’t Afford it” close – Do the math and explain why they can not afford not to buy your product. Makes all the difference in the world, must actively be brought into submission and leveraged to give you the advantage. 63% of all sales interview wind down and drift into oblivion without a direct effort to close the sale. Normally, a company’s or salesperson’s annual customer turnover should not exceed 18%. Since salespeople generally have no subordinates, they get their work done through people over whom they have little or no direct control. To make this work they build strong relationships with those people. Always be willing to describe product drawbacks. General Douglas MacArthur defined security as the ability to produce. Only sell products that you believe on 100%. You need to be just as enthusiastic about the last prospect you to talk to every day as you are with the first one. Have a “booster” week one to 4 times a year. This is a week where you are totally dedicated to maxing out your sales in a bone-crunching manner. You have to prep for it by clearing other tasks and lining up tons of sales calls that week. It is hugely motivating. The first person you meet or deal with every day will have more emotional impact on your attitude that day than the next five people you encounter. Enthusiasm will always give you the leg up on your competition. Create a customer testimonial database and keep them with you. More on this in the book. He knows that when he uses emotion and logic in the presentation, chances are excellent he will end up with a sale today and a happy customer for the future. The ideal salesman is an extrovert who develops some of the introverts characteristics. He always follows up with the sale to make sure things have gone smoothly. They involve others by soliciting opinions, sharing information, and establishing trust relationships inside the organizations. They are willing and able to help with related products and services and simplify the decision-making process for the customer by his willingness to identify other sources of help if the needs of the client extend beyond his expertise and the capability of his own company. They are focused on building internal relationships. He is a perpetual student. He studies his prospects, studies his company literature, studies his industry, and studies the art of persuasion. When talking to a prospect he does not mention irrelevant or depressing subject matter, he creates an atmosphere of excitement and optimism. He understands it is better to emulate genius than create mediocrity. He uses studies the effectiveness of his techniques, keeping those that work and dumping those that don’t. He knows he needs to get his prospect involved in the sales process on as many levels as possible. He wants the to touch, smell, feel, see and hear the product in action. He posses conviction, concern, confidence and courage. He is constantly looking to grow, never content to consider his present ability his plateau, he is always searching for ways to improve his game. He is an excellent time manager and he combines this with setting high goals. He is constantly hunting for clients, looking to create conversions in the more obvious as well as the most unlikely of places. Make certain your observations/compliments are accurate and sincere. Most people are willing to give you information if you will just ask for it. The best way to get a prospect to make a favorable new decision is to make him happy with an old decision. Always make the prospect feel kid. Verify they are willing to pay. At the key decision juncture, trust in the salesperson is a make or break factor. Once you have compromised and price, if the prospect is still hesitant, withdraw that offer and go back to the original larger figure. This will get them wanting the lower price, if they express interest in the lower figure tie them down to make a commitment then and there. If anyone makes a “significant” purchase from you, you should put him on your “super customer” list and court him as long as he is still a prospect. The “1902” close – This is where you break down the purchase into price per day over the life of the product. This enables the customer to minimize the cost in their mind. Get people out of a corner. If they have said they will “never” do something, turn breaking their vow into a positive. You make the sale when the prospect understand that it will cost them more to do nothing about the problem than to do something about it. “Marriage” Close – Sell the customer on the fact that your will offer comprehensive service for the length of time that they own/are using the product service. Sometimes suggesting the absurd or demonstrating the logical conclusion of the choice they are making is necessary. When selling to professionals, demonstrate an insane work ethic to curry favor. “Fear” Close – Once fear is established, you present your product/service as a solution to their problem. If your presentation or demonstration is fifteen minutes or longer you need to build in repetitive benefit phrases which suggest that those who buy from you enjoy certain benefits which those who don’t buy from you can never enjoy. Always make sure that you are talking to the decision maker of the family. All prospects want to be right and to be understood, they are naturally concerned about making a big mistake before making a large purchase. You goal is not to be right, but to persuade the prospect to buy. Objections thrive on the opposition but die with the agreement. You should not put yourself in a lecturer position, you must get the prospect involved. Gullible – Tell lots of human interest stories and go slow not applying pressure. Skeptical – Ask them to repeat the question and thank them for asking. Hostile – Say, I know how you feel. Others have felt this way in the past. They found when they had all the facts they were persuaded. Indecisive – Move to his side of the table and demonstrate empathy. Inner pressure is the key factor. Bargain Hunter – They want assurance they are getting a deal. Tell them the beautiful thing about your company is you treat everyone the same and no one will get a better deal than her. Tell them you will give them a special intangible you normally do not offer like personally taking the order and shipping it. Obnoxious – Give them lots of attention and challenge them. Tell them what they are buying compliments their greatness. Big shot – Let him know you are a high caliber sales person worth of working with them. Always deal with objections by asking questions. Always act grateful to be able to hear the objections. When interrupted by someone who just wants to know the price, that them for asking and tell them that you are getting to that in just one moment. There are a number of ways to dodge the question. If they insist tell them. Many people who say they will think it over, actually do not intend on doing so. A no today is better than a no tomorrow. “4 questions” close – Tell the prospect that there are only four questions that they need to ask them self. When do you want to start enjoying the benefits? Always draw out all of the objections as early as possible. Then force them to commit to buying if all of the objections are dealt with to their satisfaction. If the customer is already dealing with a trusted supplier, show your commitment to trying harder to provide even better service. Ask for only part of the business in order for a chance to win their trust. Sell on the tangible, close on the intangible. Needs to be reassured that this is the right step to take. Fears paying an inflated price for inferior value. Is buying not only for himself but with others in mind. He cares about what others will think. Always look to give the customer an excuse to buy. The prospect buys future enjoyment. You persuade people by asking questions which lead the prospect to a conclusion which demands that he take action because it becomes an idea which he originated. If you make a statement to which your prospect will readily agree (cannot refute), then ask a series of questions based on that agreement, and ask a concluding question based on those agreements… you will force the desired response. Respond to objections by asking if they will buy if their objection is dealt with. It is better to one use one technique well than several poorly. “Minor Decision” Close – Get your prospect to make a minor decision related to the purchase and use that as a springboard for a larger one. Remember, when a person brings up a logical objection you answer it emotionally, and when someone brings up a emotional objection you answer it logically. Remember that the prospect always wins when a sale is made. Always get your prospect to sit down when considering making a large purchase. Visualize the positive response of your prospect. When you deal with two or more prospects in an office or at a restaurant, be careful not to sit in-between them. Always try to move the prospect to the kitchen table when in the home. If a customer goes back for multiple looks at the product it is a good sign. When the prospect says not “but”, you know you have a prospect. For every sale, you miss because you are too enthusiastic, you will miss ten for not being enthusiastic enough. Can you see where this would save you money? If you were ever going to start saving money, when do you think would be the best time to start? Cheeks/Chin – When they touch them it is a good sign. Hands – If they massaging palm against palm, or palm against the back of the other hand it means they have assumed ownership and are ready to buy. Eyes – The wider the eyes the better. Friendly – Always a good sign. People listen more intently to things said in a low voice. Always deal with objections asap. The true professional wants the prospect to own the product so badly he strives for the yes decision again and again. Persistence is the key difference between moderate and great salespeople. Deliver a story that the prospect can relate to and compels them to buy.